Russian President met with Government members. 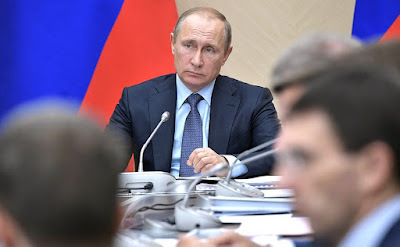 Putin.BLOG Government Russian President met with Government members. 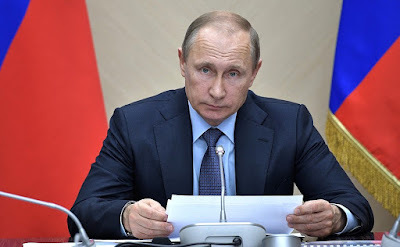 Vladimir Putin - President of the Russian Federation. Today, we will discuss an issue of great importance for practically every Russian family – how we can use information technology to improve access to medical care and medicines. But first, I would like to ask Mr. Manturov to say a few words about how the INNOPROM exhibition is proceeding. We saw its start recently. How are things now? Mr. President, let me begin by thanking you, on behalf of all Russian industry, for taking part in this event. This exhibition has become Russia’s principle industrial forum. Digitalization in industry was the main theme of this year’s event and we had a large number of IT companies taking part, even more than from manufacturing sectors. This shows that digitalization is taking place in all economic sectors without exception and in industry as well, of course. More than 650 companies took part in the exhibition. This year, we had a record number of visitors – more than 50,000 people from 98 countries. Next year, South Korea will have the status of partner country for the event. We plan to expand the exhibition space and we hope that this will attract new companies. This is also a good rehearsal for Yekaterinburg’s bid to host EXPO-2025. The bid is built around the theme of accessible innovation for our children and future generations. We are counting on support from you and Mr. Medvedev. We will soon establish an organizing committee and appoint a chairperson. Given our country’s experience in organizing and hosting big events, I am certain that we can do an excellent job of hosting EXPO-2025 in Yekaterinburg. Vladimir Putin with Government members. Who else is bidding – Osaka and Paris? Well, you will have to work at it. We have launched additional programs for car loans at preferential rates, starting July 11. Could you give us a bit more detail on this, please? Vladimir Putin at a meeting with Government members. Yes, Mr. President. Since the beginning of this year, we have been carrying out a whole range of measures to support the automotive industry. As planned, starting on July 11, we launched five new programs for car loans. We have the First Car and Family Car programs (these groups of buyers will be eligible for an additional discount of up to 10 percent). Then there are similar programs for preferential vehicle leasing, Russian Truck, Russian Farmer, and My Business. These three programs aim primarily at small and medium businesses. We have raised the discount on the first payment from 10 to 12.5 percent of the vehicle’s cost. We hope that these programs will make it possible to sell more Russian-made vehicles, at least 85,000 by the end of the year. Overall, the different programs in this sector aim to ensure production of around 670,000 vehicles by the end of the year. So far, everything is going to plan. More than 360,000 Russian-made vehicles have already been produced and sold with state support. Good. You can make a detailed analysis of the program’s results later. In 2011, we abolished licenses for some types of road transportation, including bus transportation, and since then we have seen a steadily growing number of accidents involving buses. The first half of this year saw a significant increase in accidents even compared to last year. What is your assessment of the situation and what do you think we need to do right now? Mr. Sokolov, you have the floor. It is true, overall, the number of road accidents has decreased, but the situation with bus transportation darkens the picture. Over the first half of 2017, accidents were up nearly 1.5-fold compared to the previous period. In 2015, we adopted the Federal Law on organizing regular road and municipal electric-powered vehicle passenger and baggage transportation. This law was a contributing factor to bringing down the number of accidents caused by driver error on regular bus routes by 13 percent. This was the case for regular routes, but for irregular bus services, we see that the number of accidents during transportation for personal or professional needs has increased by 63 percent. Of particular concern here is the fact that 40 percent of these road accidents are committed by people who do not have a business status, in other words, uncertified individuals rather than organizations professionally involved in passenger transportation. This year, unfortunately, several headline-making road accidents have already taken place, in Trans-Baikal Territory and Tatarstan, for example. We responded immediately. In mid-June at the Transport Ministry and on July 13 at the Interior Ministry, together with [transport safety supervisory body] Rostransnadzor, we had telephone conferences with the heads of all regions and gave instructions to take urgent measures to reduce the number of passenger transport accidents on our roads. Last year, the Interior Ministry and Rostransnadzor identified more than 1000 illegal transport service providers, opened 26 criminal cases for unlawful business activity, and 500 criminal cases for providing services that do not meet safety demands. Nevertheless, we think this is not enough. You noted quite rightly that since 2011, when passenger transportation licensing for chartered transport or personal needs was abolished, there has been a steady increase in the number of accidents in this sector. To address this issue, the Transport Ministry has drafted and submitted to the Government a draft federal law making the relevant amendments to the current law on licensing and restoring licenses for all types of road passenger transport vehicles equipped for the transportation of eight or more people. This draft law is currently going through expert evaluation. We think that it will ensure the same conditions for all bus drivers and shippers carrying out regular, irregular, charter transportation and transportation for personal needs. Also pursuant to your instructions, the Ministry of Transport has drafted a federal law amending the law on road safety, which establishes uniform traffic safety requirements for commercial carriers. We now have the same requirements for legal entities and individuals with regard to mounting tachographs on vehicles. Currently, if a bus is owned by an individual, installing a tachograph is not mandatory, since the number of working hours is not an issue in this case. However, we believe this does not make sense, because the safety of passengers depends on this, and it does not matter which bus gets into an accident, whether it is owned by an individual or a legal entity, that is, an organization. This draft law was adopted by the State Duma in the first reading in late 2016. Mr. President, we would like you to issue a directive to have the second and the third readings held as soon as possible, so that the draft becomes law and this requirement comes into force. Speaking about tachographs, many accidents are caused by drivers either falling asleep or getting distracted at the wheel. Over 550,000 buses have been equipped with tachographs and over 23,000 controller cards have been issued. All regions now have the corresponding infrastructure to install and maintain such tachographs. There are over 500 service points accepting tachograph card applications. If we see this system through to its logical completion, and all carriers start using them, then, according to experts, this will reduce the number of accidents involving buses by at least 15 percent. At INNOPROM, we saw various modern, comfortable, and efficient devices that monitor the physical condition of drivers. Of course, the issue is about cost and implementation, but, of course, we must follow this path. Look at what is available there. Yes, that is true, Mr. President. Safety comes at a cost, but it is worth paying special attention to this issue, and we are willing to develop an appropriate regulatory framework, which would make such devices mandatory for all those who engage in commercial passenger operations. Mr. Gorovoy, do you have anything to add? Mr. President, the Interior Ministry and the Transport Ministry were involved in drafting these federal laws. The statistics show a need, in our opinion, in passing these laws. I can provide two relevant figures. Four of the last seven accidents involving buses were caused by drivers falling asleep at the wheel. I am not anticipating or announcing the results of the investigations; this is a preliminary picture of what we found at the accident scenes. The second figure is that of the 115 passengers who died because of bus drivers’ errors, 39 were killed at the moment when we think the drivers fell asleep. I am fully aware that these draft laws will give us an additional tool, but at the same time, I realize the responsibility for prevention and better results of our oversight activity. On July 13, together with the heads of the regional road safety commissions and Rostransnadzor, we had a telephone conference with all regions. In the meantime, waiting for these laws to come into effect, if they are passed, we are taking the necessary measures. We have coordinated our posts and teams with bus routes and abolished the order the Interior Ministry issued five years ago prohibiting us from stopping vehicles outside of stationary posts. Our country’s geography and transportation logistics show that this was a mistake on our part when we drafted those laws. If there are violations to rules on working hours and rest time, passenger buses, including and primarily chartered ones, will be stopped and drivers will be given a chance to rest. We foresee some negative feedback from passengers, but after working a month under the new rules, I believe we will be able to encourage all businesses to follow the demands of Transport Ministry regulation 25 concerning drivers’ work-rest routine. I would like to note that in Moscow alone we have 2,300 buses coming into the city, carrying out charter passenger transportation. They are not subject to any checks by dispatchers, and passengers board the buses outside the city’s bus stations. We have turned to Rostransnadzor and by August 15, we will inspect the implementation of Federal Law 220 on organizing passenger transportation and will provide consolidated information to the Prosecutor General’s Office and the regional prosecutors’ offices. The school year is approaching, and we have 19,400 schools around the country organizing school bus transportation with a fleet of 22,500 buses. We will inspect these buses and drivers as well. Once again, Mr President, we are aware of our responsibility and we will focus efforts on addressing this sad increase by 21 percent in the number of passengers killed as a result of bus drivers’ errors. We will return to this issue some time later. For now, please tell me how things are going. This year the weather has not been good for rural residents. In this context, here is a question to Mr. Tkachev: how is harvesting progressing? A few words about the harvest. Low temperatures in a number of regions delayed harvesting by two weeks. However, farmers are actively taking in the harvest from fields. They have collected the first 20 million tons. This is a bit less than by the same time last year – 20 percent less. Nonetheless, the results in the south (Rostov, Kuban, and Stavropol, where I was yesterday) show that the crop yield will be higher and the quality of grain is fairly good. So far, crop failure has been minimal although bad weather made it difficult to work in the fields almost in all regions. The south of Russia and the Volga area were hit by heavy rain, frost and hail. Soil is waterlogged throughout Central Russia. The rates of field work have slowed down beyond the Urals, in Siberia and the Far East due to floods and waterlogging. The only threat we are facing today is that the bad weather will last through autumn, in which case it will be difficult to take in the crop. If it is fairly dry in autumn – September and October are vital for the Urals and Siberia – we can hope to harvest more than 105 million tons of grain this year. This is less than last year but enough for domestic consumption – about 70 million tons, including 20 million tons of food, 40 million tons of fodder, and 10 million tons of seeds. Another 35 million tons may be used for export. We expect despite the losses that the harvest of vegetables and fruit will be at the level of last year, primarily owing to the construction of new hothouses and the fruiting of new gardens. Cold weather and rains delayed the planting of many vegetables – cabbage, potatoes and carrots. This is why the new domestic crop was late to come to the market. Therefore, bad weather explains the additional price hike in June above the typical seasonal increase in prices. Usually, price hikes are the highest in May – domestic produce is in short supply while imports are the highest. This year prices became stable only in late June. A seven percent decline in prices was registered on July 17, when the first crops from the south of the country arrived at the shops. Vegetable prices will be much lower in August-September and the situation will be fully stabilized. In order to minimize seasonal price fluctuations over the coming years, we need to build more vegetable storage facilities that would make it possible to use Russian produce until the summer harvest. The Government State Program makes provisions for state support for building and modernizing storage facilities for potatoes, vegetables and fruit. Last year, we built and modernized storage facilities with a total capacity of 250,000 tons at a time. Now, we have a capacity of around 7 million tons, and we need around another five million. We plan to bring facilities for about another 2 million tones into operation by 2020, which will reduce the storage deficit by half. We want to carry out this program not with federal and regional budget funding alone though, but to get outside investors involved as well. This is something we discussed with the Economic Development Ministry and the Central Bank. We will get private pension funds involved in this work, which will protect us from the effects of adverse weather in the future. How much new vegetable storage capacity do you plan to build and in what timeframe? Meeting with Russian Government members. We plan to build around 2 million tons by 2020. Around 2 million by 2020? That is right, by 2020. But we still need to build another 2 million-2.5 million tons, and so this will require another 3–5 years. So, there is still a shortage of storage capacity? Yes. Mr President, we never seriously addressed this issue in the past, as you know very well. Only over these past two years, with state support, the Government has started working actively with farmers and agribusiness companies. 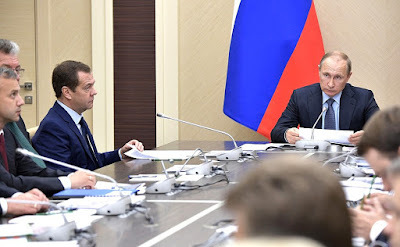 Economic Development Minister Maxim Oreshkin recently came to the Agriculture Ministry and we decided to bring in additional funding from extra-budgetary sources to speed up the implementation of this program. Let us now turn to the main item on our agenda today – using information technology to improve access to medical care and medicines. You know that back in March, the meeting of the Council for Strategic Development and Priority Projects considered ways to improve the healthcare system, including the need to actively introduce digital technology into this sphere, which will open up fundamentally new possibilities for medical doctors and, most importantly, significantly improve the level of medical care in our country. The task of computerizing hospitals and outpatient clinics, as well as connecting them to high-speed internet, was also set in the Address to the Federal Assembly. I would like to hear how this work is progressing. Notably, many medical organizations already make active use of electronic documents, electronic medical records and electronic doctor appointments. Telemedicine services are expanding. We are aware that, unfortunately, there are issues, including, strangely enough, with organizing this kind of digital work. Let us discuss this, as well. To reiterate, all of this will help the patients, regardless of their place of residence, to get qualified medical care, and doctors will be relieved of unnecessary paperwork, and spend more time focusing on the patients. Today, the State Duma is considering, in the second reading, a draft law that should form a regulatory framework for the functioning of a unified information system in healthcare. I hope that this important document will soon be adopted, and I would like you to provide a clear deadline for completing the implementation of this system. Next, the Government has already considered the issue of establishing a system for monitoring and controlling the procurement of medicines for public and municipal needs. It should reduce prices and streamline budget spending, which means that the state will be able to provide free medicines to a larger number of eligible patients. I would like to emphasize that access to free medicines is one of the most acute issues. This issue was raised, as you may be aware, during the Direct Line with the President, and the Minister of Healthcare and I have also discussed it. I am sure people in the regions put these questions to you as they do to me at various events. I would like the Government to focus on ways to resolve this issue. As far as we know, the drug procurement monitoring and control system has been in test mode since March. It should start running full-scale in January 2018. It is important to make this system fully operational, and make sure the bidders are fully accountable for the accuracy and reliability of the data they put into the system. Let us work through this issue thoroughly. Ms. Skvortsova, you have the floor. Using digital medical technology is particularly important for developing healthcare and enhancing access, quality and effectiveness of healthcare. Digital medicine is thus one of our priority strategic development projects and one of the Digital Economy program’s five main components. Mr. President, as you have said, you outlined in your Annual Address the priority steps for developing digital technology in the healthcare sector as related to overseeing the market of vitally important medicines and preventing price hikes when hospitals and medical centers make their purchases. This way we can increase the number of people eligible for state-subsidized medicines; improve working conditions for doctors, particularly in primary medical care, by cutting the time they spend on matters not related to their primary activity, and introduce convenient services for interaction between the public and medical organizations. Acting on your instructions to improve the provision of medicines and reduce inefficient spending in the regions, the Healthcare Ministry and state corporation Rostec have developed and launched the experimental operation of an information and analytical system for the monitoring and oversight of state and municipal medicine purchases. To develop a new purchase management model, the Healthcare Ministry put together a structured reference book and catalogue of medicines based on state registers, registered medicines, and maximum sale prices. Together with the relevant federal bodies – the Treasury, the Finance Ministry, and the Federal Antimonopoly Service, we integrated the new information and analysis system with the unified purchasing information system. Essentially, the catalogue of medicines is now integrated into the purchasing system. This makes it possible to rapidly analyze information on purchase planning and based on tender results. The system calculates average market prices for similar purchases of international non-patented and trademark medicines and identifies any deviations from these averages. Pursuant to your instructions of March 1, this system is now working in trial mode, collecting data, and, at the same time, working through some of the technical subtleties of the system’s functioning. To date, the system has registered 29,400 executed contracts for 22,200 trademark medicines worth a total of 20.6 billion rubles. Today, we can already see the average prices in real time, including in terms of producers, suppliers and state customers for medicines. The plan provides for putting the system into commercial operation on January 1. To make this possible we must adopt some normative acts this year. The main one is the law you mentioned, Mr. President. This is the law on a single healthcare information system on the country’s entire territory. One of its components is information and analytical monitoring of purchases. This law will also introduce regulations in electronic document management and telemedicine. On June 15, the law passed its first reading. Now it has been submitted for the second reading and for us it is extremely important to adopt this law during the spring session. Further development of the information and analysis system is related to its integration with other segments of the Single State Healthcare Information System, which will make it possible to track the entire process of pharmaceutical support: from checking the accuracy of medical prescriptions based on clinical recommendations to assessing the amounts of leftover medicines in medical institutions, pharmacies and warehouses. A relevant pilot project on providing two regions – St Petersburg and Sverdlovsk Region – with oncological medicines was launched this year in cooperation with the company Biokad. We are also planning to integrate the information and analysis system with the automated monitoring of the movement of medicines on the basis of their marking, which will allow us to quickly find low-grade and counterfeit products, recall them from the market and, most importantly, prevent their repeated return to it, that is, the resale of expensive medicines bought on government money for preferential provision. As for other components of digital medicine, in 2014 we summed up the results of the modernization program in this area and adopted a plan for developing regional medical information systems. 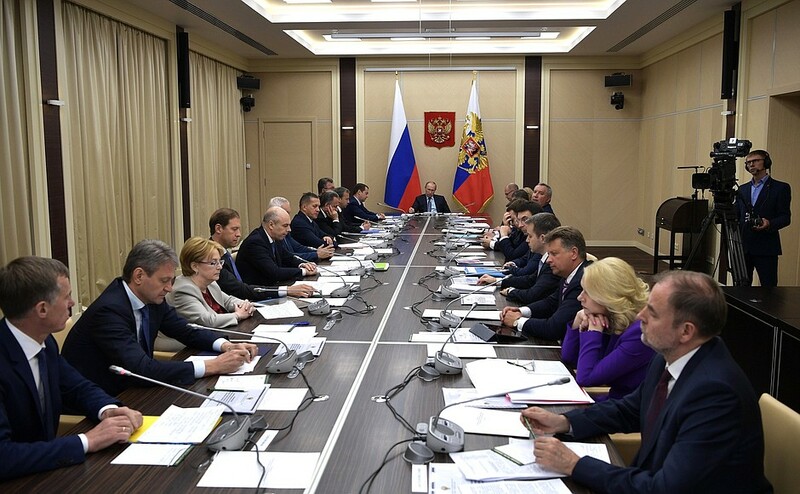 In 2015, the Healthcare Ministry signed an agreement on the regional plan for healthcare information support for three years with every region of the Russian Federation. The aim of these agreements was to even out regional differences on information support by late 2018. To date, 75 percent of the medical workers’ workplaces have been automated; 72 percent of medical organizations and detached structural units, 18,100 in total, have been connected to high-speed internet, with 13,800 medical organizations and detached units waiting to be connected. Of these, 7,100 do not have access to the internet, and 6,700 need their current connection upgraded; 64 percent of medical organizations and detached structural units are connected to a protected data transmission network. Medical information systems have been introduced in 72 Russian regions and almost 7,000 medical organizations, which is about one-third of the total need. Integrated regional medical information systems have been formed in 82 Russian regions, with the exception of Oryol and Tver regions and Chukotka Autonomous Area. Centralized Medical Image Archives websites have been created in most regions, with 66 regions actively using this website to transmit images from devices located in over 2,000 medical organizations, as well as a website for lab tests with 61 regions transmitting electronic lab results at outpatient clinics and hospitals. The medical vehicle dispatching system has been introduced in 78 regions, with over 89 percent of ambulance stations connected to it. The accessibility of medical care, quick and hassle-free doctor appointments are particularly important for our people. To achieve this, electronic schedules of doctors' hours and the possibility of making online doctor appointments have been introduced. Currently, 82 Russian regions are using the electronic doctor appointment system, except Pskov Region, the Chechen Republic, and Chukotka Autonomous Area. Our goal is to ensure consistent and high-quality doctor appointment service in all outpatient clinics of the country using the patient's user account on the Unified Portal of Public Services before the end of 2018 as medical organizations get connected to the internet. The introduction of the information and analysis system in healthcare will make it possible to launch the register of electronic medical documents. This nation-wide uniform register will contain the documents of each patient, which will make it more convenient for patients and ensure continuity in the diagnosis and treatment of patients in various clinics in different period of their lives. Needless to say, personal data on patients will be strictly protected and anonymous in the database. Access to the register will be given only to patients through personal accounts and an attending physician by agreement with the patient. The federal platform – the register of online medical documents – will be launched this year and will start gathering information after the law comes into force. The complete switch to electronic medical documents will be conducted stage-by-stage until 2024 depending on the readiness of the infrastructure of medical institutions. The deadlines for introducing electronic document management are fully coordinated with the Digital Economy program. I would also like to mention the introduction of telemedicine and its technology, which is important for making medical care more accessible and improving its quality. Remote cooperation between physicians has been practiced in Russian medicine for several years now. Tele medical complexes for communication between regional vascular centers and primary vascular units were established during the introduction of the vascular program in 2008 and have been actively working for practically a decade. Medical institutions were equipped with tele medical systems involving video links during the modernization program. Today telemedicine exists in 83 regions of the Russian Federation (the Altai Republic and the Chukotka Autonomous Area are the only two regions that are not using it) and over 4,400 medical institutions are actively using it. In 2016, we started the formation of a vertically integrated tele medical system that links our national medical research centers with relevant regional units. Seventy percent of the regions are already connected to this system. We plan to connect all 700 third level regional institutions to the federal tele medical system in 2017–2018. They will be provided with continuous methodological support, remote case conferences with video links and mandatory electronic management of paperwork and preservation of digital images. The existing base of anonymous digital medical images analyzed by the federal center specialists will form the basis for creating and implementing intelligent systems for supporting medical decisions. Notably, the first such Russian system for early diagnosis of stage one lung cancer is being effectively tested. After we properly interpreted the first 13,000 computer and magnetic resonance images and put them into the system, the program began to show high diagnostic effectiveness. This testing is carried out on the basis of the Federal Preventive Care Centre. Telemedicine technologies are used for individual health monitoring as well. Currently, Russia has a vast array of non-invasive personal telemedicine devices for remote interaction between the doctor and the patient. This year, we will finalize the implementation of two pilot projects in Tyumen and Leningrad regions, where we remotely monitor at-risk patients’ blood pressure. According to preliminary data for the first half of the year, such an approach allows us to correct the pressure in a timely manner, and reduce the number of hypertensive crises, emergency hospitalizations involving an ambulance, and the death rate. Within the framework of the national Health Net program, one of the objectives to achieve by 2025 is to expand the individual health monitoring system to all regions of the country. Mr. President, today we have already made good progress in developing digital medical technologies, and all of our plans, both the near- and medium-term ones, will be implemented under three basic conditions. They include the early adoption of the law (we hope, it will be done during this spring session), since it is the law that establishes the mandatory operation of the regional segments of our system. The second is the implementation by the regions of the road maps on regional computerization signed by the governors. The third is the execution of the plan of the Ministry of Communications based on the directive in the Address, on connecting all outpatient clinics and hospitals to high-speed internet by late 2018. The Duma spring session will last only three more days. Mr. President, the hearing of the law will be held today at 18.30. 0 Comment to "Russian President met with Government members."